Milk thistle (Silybum marianum) is a perennial herb believed to have medicinal properties. The seeds contain silymarin, a group of compounds said to have antioxidant and anti-inflammatory effects. Milk thistle is commonly used as a home remedy to treat liver problems, often under the presumption that it will "detoxify" the liver. At present, there is not enough scientific data to say whether milk thistle can help the liver or not. While it is not without benefit, milk thistle doesn't appear to exert a significant effect on either liver tissues or liver function. Milk thistle is also known by the names Saint Mary's thistle, variegated thistle, and Scotch thistle. In traditional Chinese medicine, milk thistle is referred to as da ji, while the seeds are called shui fei ji. Although milk thistle is most often used for liver conditions, such as hepatitis and cirrhosis, the herb is believed some to prevent or treat high cholesterol, diabetes, heartburn, upset stomach (dyspepsia), hangover, gallbladder problems, menstrual pain, depression, and even certain types of cancer. Few of these claims are supported by hard evidence. Some preliminary studies have suggested that silymarin may improve liver function by keeping toxic substances from binding to liver cells. However, studies on the milk thistle's effectiveness in treating liver disorders have yielded mixed results. According to a comprehensive review of studies in the American Journal of Gastroenterology, milk thistle neither improves liver function nor reduces the risk of death in people with alcoholic liver disease, hepatitis B, or hepatitis C.
Several smaller studies have suggested that milk thistle may benefit people with mild, subacute (symptom-free) liver disease. An early study from Finland found that a four-week course of silymarin supplements lowered key liver enzymes in people with subacute disease, suggesting the liver was functioning more normally. 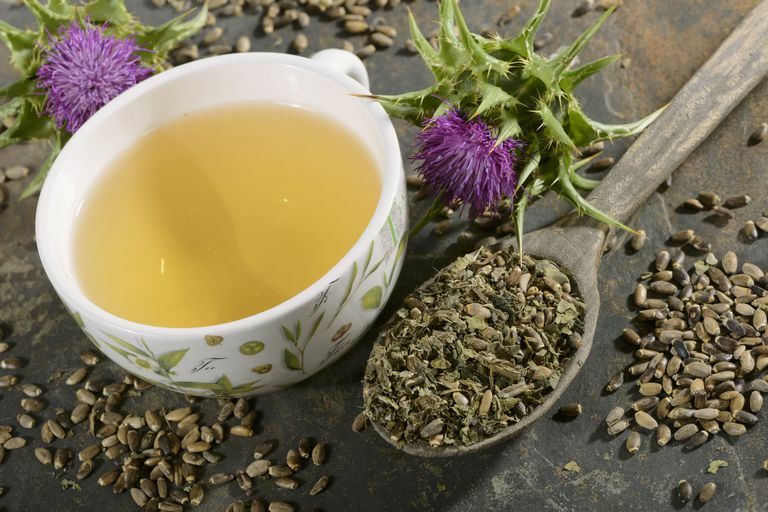 Despite the positive findings, subsequent studies have been unable to replicate the results or demonstrate that milk thistle prescribed on its own would render the same effects. Milk thistle is sometimes used by people with chronic hepatitis C (a viral infection characterized by the progressive scarring of the liver). In fact, a survey funded by the National Institutes of Health reported that 23 percent of 1,145 people with hepatitis C used herbal supplements, with milk thistle being by far the most common. According to the survey, people with hepatitis C reported fewer symptoms and a "somewhat better quality of life" when taking milk thistle despite having no measurable change in viral activity or liver inflammation. A 2012 study published in the Journal of the American Medical Association (JAMA) confirmed this. Despite being well-tolerated in the study participants, silymarin (prescribed thrice-daily in 420- or 700-milligram doses) had no tangible effect on liver enzymes. Given these contradictions, many scientists believe that milk thistle delivers something of a placebo effect in which a person feels an improvement in symptoms despite having no change in their clinical condition. Several studies have suggested that milk thistle may be beneficial for people with diabetes, most notably in those with type 2 diabetes. According to 2015 research published in Phytomedicine, a 45-day course of silymarin increased the antioxidant capacity and reduced generalized inflammation in adults with type 2 diabetes better than a placebo. According to the study's authors, the findings suggest that silymarin may reduce the oxidative stress typically associated with diabetes complications. A systematic review conducted in 2016 further concluded that the routine use of silymarin appears to reduce the fasting blood glucose and HbA1C levels, although the authors warned that the quality of the reviewed studies was poor. Milk thistle may trigger a number of side effects, including headache, nausea, diarrhea, abdominal bloating, and gas. Less commonly, muscle aches, joint pain, and sexual dysfunction have been reported. Allergic reactions are also possible. People with allergies to ragweed, daisies, artichokes, kiwi, or plants in the aster family may also be allergic to milk thistle. On rare occasion, milk thistle can cause a potentially life-threatening, all-body allergy known as anaphylaxis. Call 911 or seek emergency care if you experience shortness of breath, rash, hives, rapid heartbeat, lightheadedness, or swelling of the face, tongue, or neck after taking milk thistle. If left untreated, anaphylaxis can lead to shock, coma, cardiac or respiratory failure, or death. Milk thistle may reduce your blood sugar, so it needs to be used with caution as it may trigger hypoglycemia (low blood sugar) in people on diabetes medications. Since milk thistle exerts a mild estrogen-like effect, people with hormone-sensitive conditions like endometriosis, uterine fibroids, or cancers of the breast, uterus, or ovaries should avoid the supplement. Milk thistle may also reduce the effectiveness of estrogen-based contraceptives. Other interactions are possible. To avoid complications, always advise your doctor about any supplements or herbal remedies you are taking. There are no guidelines directing the appropriate use of milk thistle. Milk thistle supplements are commonly sold as in capsule form but are also available as tablets, tea bags, and oral tinctures. Doses range from 175 milligrams to 1,000 milligrams. Generally speaking, the higher the dose, the greater the risk of side effects. Combination remedies such as Iberogast drops (used to treat dyspepsia) and Barberol tablets (formulated for diabetics) are considered effective with milk thistle doses of 10 milligrams and 210 milligrams, respectively. Higher doses don't necessarily correspond to better results. Dietary supplements containing milk thistle are sold in natural foods stores, drugstores, and stores specializing in herbal products. You can also purchase milk thistle products online. Dietary supplements in the United States do not need to undergo the rigorous testing and research and testing that pharmaceutical drugs do. Because of this, the quality can vary from one supplement to the next. To ensure quality and safety, choose products that have undergone testing and certification by an independent certifying body like the U.S. Pharmacopeia (USP), ConsumerLab, and NSF International. As an added layer of safety, opt for brands that have been certified organic under the regulations of the U.S. Department of Agriculture (USDA). Be wary of dried whole milk thistle or milk thistle seeds, both of which are vulnerable to fungal contamination, according to research published in the International Journal of Food Microbiology. By contrast, fungal contamination is rare in milk thistle tea bags, extracts, capsules, tablets, and soft gels. Can you grow their own milk thistle? Milk thistle is a hardy plant that grows well in all different environments, although it prefers high temperatures and dry conditions. The soil also needs to be well-drained. To grow milk thistle, spread the seeds over the loose soil in the spring or fall. Milk thistle seeds only take only around two weeks to germinate. Since milk thistle grows in clumps, space each cluster of seeds about 12 inches apart. Milk thistle is drought resistant and needs very little watering. Once the flowers have finished blooming, they will leave behind seed clusters. You can harvest these and extract the seeds by removing the fluffy fibers surrounding them. You can then either air-dry the seeds or use a home dehydrator (which reduces the risk of fungal contamination). Once dried, you can grind the seeds into a powder with a mortar and pestle. Milk thistle tonic is typically made by steeping a tablespoon of crushed seed in three cups of hot water for 20 minutes. Do not harvest milk thistle plants that have been exposed to pesticides or found along roadways or industrial sites. Can Milk Thistle Increase Breast Milk Supply? Ebrahimpour, K.; Gargari, B.; Mobasseri, M. et al. Effects of Silybum marianum (L.) Gaertn. (silymarin) extract supplementation on antioxidant status and hs-CRP in patients with type 2 diabetes mellitus: a randomized, triple-blind, placebo-controlled clinical trial. Phytomedicine. 2015 Feb 15;22(2):290-6. DOI: 10.1016/j.phymed.2014.12.010. Fried, M.; Navarro, V.; Afdhal, N. et al. Effect of silymarin (milk thistle) on liver disease in patients with chronic hepatitis C unsuccessfully treated with interferon therapy: a randomized controlled trial. JAMA. 2012 Jul 18;308(3):274-82. DOI: 10.1001/jama.2012.8265. Rambaldi, A.; Jacobs, B.; Iaquinto G, Gluud C. Milk thistle for alcoholic and/or hepatitis B or C liver diseases--a systematic Cochrane hepato-biliary group review with meta-analyses of randomized clinical trials. Am J Gastroenterol. 2005 Nov;100(11):2583-91. DOI: 10.1111/j.1572-0241.2005.00262.x. Salmi, H. and Sarna, S. Effect of silymarin on chemical, functional, and morphological alterations of the liver. A double-blind controlled study. Scan J Gastroenterol. 1982;17:517–21. Seeff, L.; Curto, T.; Szabo, G. et al. Herbal product use by persons enrolled in the Hepatitis C Antiviral Long-Term Treatment Against Cirrhosis (HALT-C) Trial. Hepatology. 2008;47(2):605-12. DOI: 10.1002/hep.22044. Voroneanu, L.; Nistor, I.; Dumea, R. et al. Silymarin in Type 2 Diabetes Mellitus: A Systematic Review and Meta-Analysis of Randomized Controlled Trials. J Diabetes Res. 2016;2016:5147468. DOI: 10.1155/2016/5147468. Can Alpha-Lipoic Acid Aid in Weight loss, Diabetes, and Nerve pain? Can Stinging Nettle Treat Arthritis, Allergies, and Enlarged Prostate? Should I Be Taking a Glycine Supplement? Can Calenula Help to Cure Wounds?